Nonprofit organizations often need to manage many types of interactions from donors, partners, supporters, employees and clients. A CRM database can assist with managing these interactions and streamlining processes. Nonprofits can use a CRM database to track donations, email volunteers and keep records. Many of these organizations are unaware that they are eligible for nonprofit pricing with both Salesforce and Microsoft Dynamics CRM. 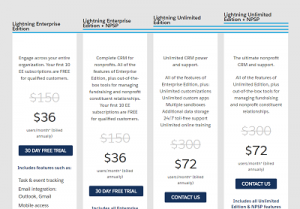 Microsoft Dynamics CRM has plans ranging from $3.75 to $110 per month per user. In general, most organizations would need Microsoft Dynamics CRM Professional license which is $15 per month per user for nonprofits, versus the regular MSRP for a Microsoft Dynamics CRM Professional license at $65 per month per user. Salesforce has nonprofit plans ranging from $36 to $72 per month per user. In general, most organizations would need Lightning Enterprise Edition licensing which is $36 per month per user for nonprofits, versus the regular MSRP for a Lightning Enterprise Edition license at $150 per month per user. Salesforce also gives ten free licenses to qualifying nonprofits. TopLine Results can help you get started with a trial of either product and review the eligibility requirements. We also assist nonprofits with database customizations to meet their unique needs, training and support. To find out if your organization qualifies, contact us at 800-880-1960 or info@toplineresults.com.